Five new scrapbooks from High Point have been digitized and are now available at DigitalNC, courtesy of our partner, the Heritage Research Center at High Point Public Library. These scrapbooks date from December 1962 to October 1965. They join previously digitized collections, dating back to 1952. 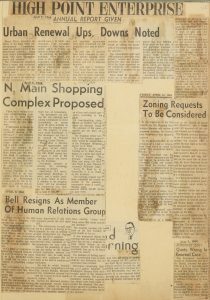 A scrapbook page from April 1964 with articles on urban renewal in High Point and a proposal for a shopping complex on N. Main St. These scrapbooks contain newspaper clippings from the High Point Enterprise and Greensboro Daily News, arranged in chronological order. In many cases, articles were pasted and taped into the scrapbooks overlapping each other, so digitizing required taking multiple images of each page. Many of the newspaper clippings relate to local events in High Point and Greensboro, including political events and local races, decisions about local laws and town planning. Every so often, national events are also included, like the Beatles’ tour of the United States in 1964. 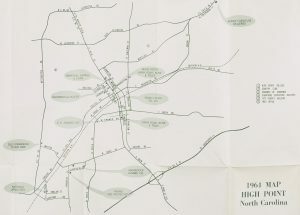 A 1964 map of High Point and the surrounding area. From the High Point Museum we have added ten new maps and atlases of High Point from the 1950s to the mid-1970s. The maps show roads, schools, municipal buildings, schools and local businesses in the High Point area and surrounding suburbs. Occasionally there are larger maps with information about Greensboro or Winston-Salem. Many of the maps also include facts about High Point, like the population, number of churches, list of media outlets, and photos of local businesses being highlighted. To see more materials and learn more about the Heritage Research Center at High Point Public Library visit their partner page or take a look at their website. Visit the High Point Museum’s website or High Point’s partner page to learn more about them.